Its name means "Lost Island" in Spanish, but Perdido Key is discovered by more and more people each day. Stephen Leather man, environmental scientist - rated Perdido No. 13 among several hundred beaches in 1998, giving high marks to the sugar-white sand, emerald-green water, sprawling areas open to the public, and laid-back atmosphere. Perdido Key, a barrier island on Pensacola's western side, offers wide swaths of beaches and dunes protected from development by the Gulf Islands National Seashore and the State of Florida. Big Lagoon State Park is an especially attractive setting for hiking, boating, swimming, fishing and camping. In fact, Perdido Key today is much like the pristine island European explorers found three centuries ago, although the area now offers plenty of activities. There's a diverse mix of lodgings, from an RV park to motels, with the emphasis on condominiums and the comforts they offer to families and individuals. You will find fishing both off-shore and on-shore, the awe-inspiring National Museum of Naval Aviation, environmentally friendly island golf courses, tasty restaurants, quirky shops, Pensacola Greyhound Track, and a songwriters festival each November. 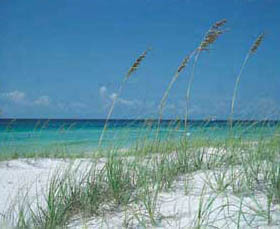 Pensacola Beach is the hub of Santa Rosa Island, first discovered centuries ago by Spanish conquistador's. Santa Rosa Island offers miles of unspoiled white sand, blue-green water, numerous restaurants, and a taste of history. Much of this barrier island is protected from development. The Gulf Islands National Seashore keeps beaches accessible to the public and preserves the area's environment and history. The central business district, Pensacola Beach offers restaurants, shops and entertainment. The calendar is filled with special events, from a rollicking Mardi Gras to stylish wine-toasting, scrumptious food fetes and a Bushwhacker Weekend. Restaurant menus are a marvelous mix - from elite dining to down-home cooking - and nightclubs keep a steady beat. Public pavilions provide free jazz, blues, rock and country music several nights a week during warm weather. Sun-seekers can mix and mingle at popular beaches or, if they prefer, they can claim isolated stretches of sand for themselves. Motorboats, sailboats, surfers and windsurfers coexist easily in the Gulf and bays while parasail float overhead and fishermen try their luck from sea and shore.